Not just adorable, this super-soft llama is also helpful with holding doors open. You may know that llamas make excellent sheepherders and are known to spit in self-defense—but who knew that they're also handy for holding doors? So courteous! This super-soft, South American helper with a sand-weighted bottom makes a delightful doorstop and a placid, pettable addition to your decor. Spot clean. Made in China. 9.5" L x 5.75" W x 12" H; 3lbs. I have a longstanding love for llamas. This little guy had to be mine! I love everything about my llama. No cons. Great buy. I was afraid it wouldn't be heavy enough to keep the closet door closed in my living room. The house is from 1880 and has a couple doors that just don't stay closed. This is the best! It is perfect weight, darling to look at and a conversation piece. I love it. Am going to purchase more! This is such a cute and completely functional doorstop. I have a bathroom door that will always close unless there is a doorstop to prevent it. It's the perfect weight to keep the door open as desired. It is a cute and different type of door stop....great for the kids. We use it to prop a door open. Every time I pass it I feel like I have a gentle friend. The wind constantly slams doors in our house shut all the time. The problem is particularly bad for one of my kids' rooms. I really needed to find a doorstop that would prevent this. Initially, I bought one of those plastic triangle doorstop wedges to solve the problem. It didn't work well -- it was constantly getting knocked out of place for various reasons, and thus did not solve the problem of the door slamming. I happened to see the llama doorstop on Uncommon Goods, so I went ahead a bought it. It was a little more than what I had wanted to spend on a doorstop, but it is well worth the price! 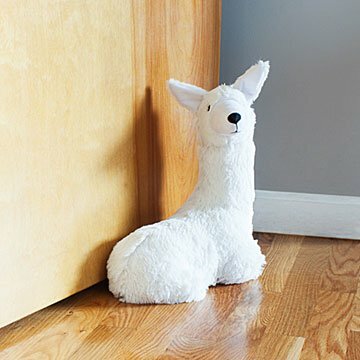 The llama doorstop is exactly what I was hoping it would be. First, it is absolutely adorable sitting on the floor. Never thought I would find a doorstop so cute! Lol. Second, the llama is substantial and a good size without being too big. It really does its job of not allowing the door to move from the cross-breezes we get through our house and the occasional wind gusts. Third, while it is a good weight, it is not something that I fear will cause a broken toe if someone accidentally bumps into it or catches it with a foot or toe. Per its tag, the filling material is 50% polyester fiber and 50% sand. Fourth, the llama itself has a really nice softness to it. The ONLY potential con I could see with this llama doorstop is that it could get dirty at some point down the road. The tag says spot clean only if needed. We've been using it for weeks already and it does not have any dirt or marks on it. I think this llama doorstop will be something we use for a LONG, LONG time at our house. I couldn't be happier with this!